NATO’s humanitarian war in Kosovo in 1999 provides the context for the central idea of this book. In that conflict, the puzzling linkage between the desire to advance human rights and military means raises far-reaching questions about the role of rights in shaping international wars. Is it possible to understand or explain wars as an outcome of perceptions of rights? How did rights, be they divine rights in the Middle Ages, territorial rights in the eighteenth century, or human rights today, become something that people are willing to fight and die for? 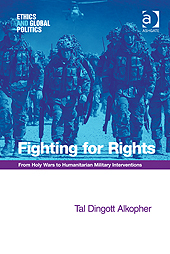 [Tal Dingott Alkopher, Hebrew University of Jerusalem, previews her new book, Fighting for Rights: From Holy Wars to Humanitarian Military Interventions (Ashgate, 2013). NATO’s humanitarian war in Kosovo in 1999 provides the context for the central idea of this book. In that conflict, the puzzling linkage between the desire to advance human rights and military means raises far-reaching questions about the role of rights in shaping international wars. Is it possible to understand or explain wars as an outcome of perceptions of rights? How did rights, be they divine rights in the Middle Ages, territorial rights in the eighteenth century, or human rights today, become something that people are willing to fight and die for? To answer these questions, Fighting for Rights explores the linkage between concepts of rights and the practice of war in the international arena. This book describes how normative structures of rights have shaped different practices of war from medieval to modern times. From the eleventh to the thirteenth century, concepts of divine rights and institutionalized practices of the Crusades to the Holy Land fostered the prevailing ideas of international rights and war. In the eighteenth century, the institutionalization of states’ rights and territorial wars shaped international conflict. This view held until the late twentieth century when the institutionalization of human rights, coupled with the emerging practice of humanitarian war, particularly NATO’s war in Kosovo, engendered new norms of international conduct. Although each period is historically distinct, the lessons learned from exploring war and conflict during the Crusades have important implications in light of world politics after 9/11. As then, the discourse today is preoccupied with religion’s impact on contemporary international relations. The last chapter of the book addresses, then, the impact of divinely sanctioned and exclusive concepts of values on international relations, especially in the context of the global fundamentalist terror and the war against terror. The chapter also assesses the prospects of humanitarian war in the twenty-first century. Finally, the chapter describes how rights have the power to constitute an international order that will be either cooperative or conflictual and how the choice of outcome is very much in our hands. The sources of rights, their nature and definition, are not fixed, but exist in people’s minds; they are the product of social convention and cultural and historical development. This book’s main contribution is theoretical; it explores the impact of rights on wars through the lens of social constructivism. For years, International Relations research tended to view “ideas” and norms in general and rights in particular as accounting for cooperation and peace rather than conflicts and wars. The concept most widely favored, especially by political realists, for interpreting human conflict was that of power. This book, in contrast, explores how ideas, norms, and rights shape wars. Indeed, in recent years certain researchers, particularly from the EnglishSchool tradition and constructivism, have focused on “bad” norms that promote conflicts in the name of justice. According to Hedley Bull, for example, war is institutionalized by certain orders, norms, and rules that include understandings about the legitimate circumstances for going to war, as well as the legitimate authority to conduct it. For Bull, however, norms only affect order and cooperation within war; war itself is the natural product of anarchy in international relations. Bull and other English School writers have yet to treat normative variables as analytical explanatory tools. They remain preoccupied (important as it is) with articulating normative theories that serve as a key frame for ethical analysis rather than theories of norms that explain why and how normative (“bad” norms included) and cultural variables account for international relations. A. Wendt, a leading constructivist scholar, demonstrates the explanatory force of norms in general, and of “bad” norms in particular, by highlighting their constitutive impact on international relations. He does so by portraying a Hobbesian international system constituted by a culture composed of violence-disposing norms. Wendt’s work further led scholars to view the phenomenon of war through constitutive, ideational, and normative prisms. A prominent example is the work of Martha Finnemore, who shows that over the last four centuries military interventions were constituted by different perceptions of political order. Another example is N. J. Wheeler’s work on the constitutive power that the idea of legitimacy gave to humanitarian interventions in the 1990s. While continuing this line of thinking, this book theorizes about the constitutive impact of rights on wars. Rights are a special kind of normative structure. In contrast to the vast existing literature on human rights and the use of force, this book not only discusses human rights but also the more general concept of rights as conflictual norms by pinpointing the various levels at which rights affect wars in the international arena (this also allows a broader historical research dealing not only with modern, but also with premodern and medieval international relations). The book demonstrates how internationally-defined rights constitute throughout history the “rules of the game” and form the basis for warlike interactions by endogenously defining the actors involved, their targets, and their legitimate steps. The book’s conceptual framework establishes a constructivist view of rights and introduces a constitutive relationship between rights and wars. The constitutive impact of rights on wars is manifested on three different but coexisting levels. On all three levels, it is evident that rights create conflict by motivating members of societies toward aggressive behavior. At the first level, rights by definition have a subtractive character because of the priority they give to the rights-holders in confrontations with other parties. Thus, the entrenchment of rights into social structures creates a predisposition to conflict within societies. The more exclusive and absolute the conception of rights (i.e., the more rigidly those concepts define which international actors are entitled or not entitled to rights in the international arena), the more zero-sum international relations are. Constructing a game as zero-sum (this time ideationally rather than materially) means more aggression and violence. Christian medieval society, for example, is described in this book as a closed society characterized by dogmatic Christian concepts of divine rights. As a result, Christian society was a militant community confronting the pagan world. Similarly, an exclusive concept of sovereignty engenders conflict in the modern Westphalian system of states. However, early-modern ideas of sovereignty also depended on (positive) social construction and thus on mutual recognition of states. This attribute made the eighteenth-century wars less extreme (sacre) than those four hundred years earlier, and since the seventeenth century, the Crusades (as wars that deny the legitimacy of the other) have stopped. International society today believes that universal human rights are inclusive because they embrace human beings, not just every member of a certain category. However, there is a fly in the ointment. A multidimensional structure of rights constitutes other reasons for conflicts. Today, multidimensionality is manifest insofar as the collective recognition that the international community is responsible for human rights augments the rights of the state, which, until recently, were the only significant rights at the international level. In 1999, a key struggle in Kosovo led to a “humanitarian” war. Here, state rights and human rights clashed at the international level. The constitutive impact of rights on wars at the second level is manifested when a right-violation situation constitutes a possibility of the use of violence by the rights-holders or by those aiming to protect those rights. My claim here is that perceiving a situation as one of right-violation produces in a society an experience of threat and injustice emanating from a sense of entitlement. The sense of entitlement has such moral power that, when unsatisfied, it induces emotional effects of distress, “just” anger, and aggression together with behavioral outcomes of protest and even the use of violence aimed at restoring justice and protecting what are conceived as essential needs. Thus the Crusades, the territorial wars of the eighteenth century, as well as NATO’s humanitarian military intervention in Kosovo, were all inspired by strong emotive reactions to the violation of rights. The Muslim occupation of the Holy Land was perceived by Christians as a violation of the divine order and rights, and thus as an offense, an act disgracing God. Similarly, the rights of the state were emotionally associated in the seventeenth and eighteenth centuries with the state’s honor, especially when defending this honor was at issue. Physical attack was seen as an assault on the state itself that produces an urge to revenge, even by force, aimed at restoring the state’s honor and repairing its rights. Humanitarian interventions are often described as stemming from a sense of “humanitarian urgency” or “shock of conscience” experienced by those who witness the travails of a defenseless population. Backing for NATO action in Kosovo also appeared to be emotional, inspired by the news and pictures of massacres and the stream of refugees. As for the third level at which rights affect wars, a close investigation reveals that throughout history, societies’ perceptions about the legitimacy of a war and about the legitimate authority for conducting war (the rules of just wars) are formed according to the prevailing conceptions of rights. This assertion is not only significant in that it identifies the relationship between just-war thinking and the concepts of rights, but also in that it differs significantly from the more common emphasis in International Relations on the regulative and restrictive nature of the rules of just wars. Muslim and Hungarian invasions of Europe, as well as religious reforms initiated by the papacy in the tenth and eleventh centuries, brought the Church to transform the just-war theory, originated in the fourth century, into a holy-war conception. This development inspired an offensive war against the pagans in the Holy Land that was characterized as the Crusades. In the eighteenth century, war was no longer seen as aimed at executing the divine judgement on the evil pagans but rather as manifesting the reason of state. Just-war thinking reached an apex of legitimizing every use of force aimed at protecting the right of the state. Even wars that were not defensive in character and aimed at preserving the balance of power, such as the War of the Spanish Succession (1700-1701), and wars involving an unexpected use of force, such as the Prussian invasion of Austria in 1741, were considered just, preventive wars. The beginning of the twentieth century saw the institutionalization of modern just-war thought, according to which states had the exclusive right to defend their claims by force. Over the past decade, however, evolving norms have granted states the right (and responsibility) to conduct a war against other states so as to impose basic human rights. This evolution was manifested during the 1990s in several cases of humanitarian intervention such as in northern Iraq (1991), Somalia (1992), Bosnia-Herzegovina (1995), and finally in NATO’s intervention in Kosovo. In sum, this book maintains that concepts of rights may have constitutive effects on wars in the international arena, and therefore a constitutive explanatory power. They do not explain wars in terms of the immediate choices that bring leaders to decide to launch a war, that is, rights do not solely explain why a certain war occurred; instead, they account for some of the necessary conditions that facilitate international wars. Wendt, A. (1999) Social Theory of International Relations. Cambridge: CambridgeUniversity Press. A constitutive explanation emphasizes the impact of ideational variables (i.e., norms, values, culture) as a background for social reality in general and for international relations specifically. In other words, it explores the ideational properties that “constitute” a certain social reality/activity. In that sense, a constitutive explanation is not only logically prior to causal material and rationalist explanations, but it also specifies the factors that enable a certain activity rather than what regulates an antecedently existing activity. Finnemore, M. (2003) The Purpose of Intervention: Changing Beliefs about the Use of Force. Ithaca: CornellUniversity Press. Wheeler, N. J. (2003) Saving Strangers: Humanitarian Intervention in International Society. Oxford: OxfordUniversity Press. This literature is preoccupied with questions such as: Does there, and why does there, exist a moral obligation for someone who is outside the borders of the state, and how does this moral obligation assume a political character? How does the obligation to help others justify killing (the use of force); in other words, how can humanitarian actions justify bloodshed?